Jesus offers the believer an opportunity to have ownership in the coming Kingdom of Heaven. A great deal of Jesus’ earthly teachings and interactions pointed toward this opportunity. Before examining a passage that clearly speaks to this fact, a short review is imperative. In the previous lesson, we looked at Matthew 13:44-46 which dealt with two parables that were communicated to the disciples in private and involved scenarios where something of great value had been found and the one who found it sold everything that they owned in order to make it their own. Jesus’ point in both parables is clear: When you come across the truth of the kingdom of heaven, do whatever it takes to make it your own. Sell all that you have, forsake all that is less, and lay hold of the opportunity to have ownership of the kingdom of heaven. It will certainly cost you, and to some the cost will be great, but this cost is but a minuscule inconvenience when compared to the brilliant glory and bursting riches that await you in the coming Kingdom of Christ. Whatever it takes, it is most certainly worth it! 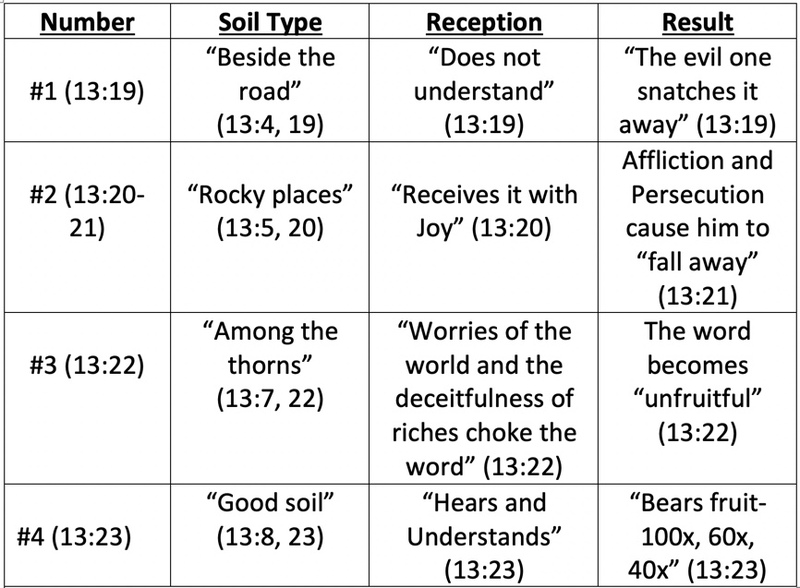 Before entering into our first case study on this truth, we must also review the Parables of the Soils because it tells us of the different types of reception that occur when one has come across the “word of the kingdom” (Matt 13:19). A believer’s reception of this truth can have four possible results, but only one “bears fruit” (Matt 13:23b). All others, let us be warned and fully aware, fail to enjoy this end. With these results in mind, we turn to Matthew 19:16-30. Matthew 19:16-22. The scene begins with a man who comes to Jesus asking a question in regards to what “good thing” he could to do “obtain eternal life” (Matt 13:16). This question may be disturbing to some readers since it obviously gives this idea that “eternal life” can be earned by works and no one would argue that the man is asking Jesus a “works” question. Jesus questions the man’s inquiry about what is “good,” tells the man that only God is good, and then proceeds to answer his question (19:17). In this way, Jesus is communicating clearly that He is God, seeing that He can provide a perfect answer to this man’s question. Many have understood this interaction as the man’s inquiry into what must be done to be saved, which deems the man as a “lost” person. Commentators will note that Jesus gives the man some of the commandments from the Law of Moses (19:18-19) in order to show him what an awful sinner he is. When the man replies that he has kept these things since his youth (19:20), he is obviously lying and Jesus goes for the jugular by calling on the man to part with his personal portfolio so that he will demonstrate a “true desire” to have “genuine salvation.” Because the man walks away greatly troubled, these commentators have concluded in their application to us that we must be willing to give all that we have in order to go to heaven when we die, and because the rich young ruler was unwilling to part with his wealth, he will spend an eternity in the Lake of Fire. In short, they have taken this passage as an evangelistic encounter. We must be aware that “eternal life” is not always understood in the Scriptures to be speaking ONLY to the free gift that one receives when they believe in Jesus (John 3:15, 16, 36; 5:24; 6:47, 54; 10:10a, 28; Acts 13:46, 48; Titus 1:2; 1 John 5:11-12). “Eternal life” can also speak to a quality of life to be experienced in the here and now by believers as they “abide,” surrender, or submit to the Lord’s Word (John 10:10b; 17:3; 1 Tim 6:12; 1 John 1:2; 2:25; 3:15; 5:20). But “eternal life” can also be understood as the believer in Christ having a rich inheritance in the coming kingdom, which is considered to be the “end” of our salvation (Matt 19:29; Mark 10:30; Luke 18:30; Rom 2:7; 6:22; Gal 6:8; Jude 21). From this evidence we can see that the phrase “eternal life” can be used concerning our justification, sanctification, or glorification, and that the context of the passage will determine the intention of the author in using this phrase. Also in question is the word “obtain,” which is the word echō in the Greek and would be better translated as “have.” Whether “obtain” or “have,” the point is clear that the man wishes to possess eternal life for himself (this same scenario is recounted in Mark 10:17 and Luke 18:18 with the words documented as “inherit eternal life”). This does not deal with the lost getting saved, but with the saved obtaining a rich entrance in the kingdom of heaven. Jesus’ reply to this question gives the man a “works” answer. The man in question obviously knows that he is lacking something due to the nature of his initial question (19:16) and his response to Jesus’ recommendation (19:20). Jesus’ call to keep the commandments was not to force a condemnation upon the man’s inadequate living, but to point him in the direction of cultivating interpersonal relationships. Loving others is a clear indication that we love God (John 13:34-35; 1 John 7:7; 2:5; 4:7). Jesus was also not calling on the man to keep the commandments in order to earn acceptance with God. Jesus was showing him that in keeping these commandments he was propagating fellowship with God. The second way that we know that this exchange is regarding “eternal life” as this man’s quality of glorification is in verse 21 when Jesus tells him, “If you wish to be made complete…” This Greek word is teleios meaning, “brought to its end, finished; wanting nothing necessary to completeness; perfect.” Louw and Nida define this word as “pertaining to having no defect whatsoever.” This word speaks to being “perfect,” but can also be understood as being “mature, fully-grown” (Jas 1:4). Jesus calls the man to sell his possessions, give the money to the poor, and to come and follow Him on His journeys. Jesus even goes so far as to tell this man that if he does what Jesus has asked of him, he will have “treasure in heaven” (19:21). Having inquired about having/obtaining/possessing eternal life, Jesus’ directive is to give all that he deems precious in order to lay hold of eternal life, much like Jesus’ words to the disciples in Matthew 13:44-46 when He speaks of those who gave all in order to make the kingdom of heaven theirs. If this is what Jesus is telling the man, would it not make more sense to tell him how he can be a mature, fully-grown disciple who is complete, not lacking in anything rather than considering him to be a lost, unregenerate person and immediately calling him to be complete and perfect, being fully-grown and mature? It would be foolishness to think that Jesus is calling this man to part with all of his possessions in order to be justified since the goal placed before the man is equated with “treasure in heaven” and “full maturity” or “completeness.” Such a conclusion accounts for the man’s “selling of his possessions” as part of what is necessary in order to be accepted before God. If this is the case, where does the cross of Christ come in? This view deems it as secondary, or only PART of what is necessary to complete the whole and to legally render the man as “saved.” No, Jesus’ answer is not a works answer because that is what is necessary to go to heaven when you die. He answers this way because this is the pathway to having a full experience in following Jesus so that he will have “treasure in heaven” (19:21b). This understanding corresponds perfectly with what Jesus taught the disciples in Matthew 19:44-46. Sell all that you have if that is what it takes to possess/have/obtain the kingdom of heaven. Jesus is calling him to start living the abundant life (John 10:10b). This reply causes the man to end the conversation, and he leaves “grieving” (lypeō- distressed, sorrowful). The reason for his sorrow is provided by Matthew, noting that he “owned much property,” meaning that he had many earthly possessions, which could include land, or possibly an estate. This is a terrible occasion, considering what the man was giving up in the eternal so that he could maintain what he had in the temporal. We see the trappings of such motivations in the words that the Apostle Paul spoke to Timothy, writing “But those who want to get rich fall into temptation and a snare and many foolish and harmful desires which plunge men into ruin and destruction. For the love of money is a root of all sorts of evil, and some by longing for it have wandered away from the faith and pierced themselves with many griefs” (1 Tim 6:9-10). One last important point to notice is that Jesus equates “treasure in heaven” in 19:21b with the man’s initial question of obtaining “eternal life” in 19:16. Jesus makes this connection to provide us with a greater understanding of what is being considered (and continues to do so in the narrative) so that we are not confused or misled in our interpretation of this situation. This rich young ruler would be someone who has heard the “word of the kingdom” (Matt 13:19a) but has allowed for the riches of this life to choke out his opportunity to not only become part of Jesus’ entourage, but to have great riches and rewards in the coming Kingdom. He would fall into category #3 in the Parable of the Soils. Matthew 19:23-26. At this point, Jesus turns to His disciples and uses this situation as a teaching moment. “It is hard for a rich man to enter the kingdom of heaven” (19:23). Notice that Jesus equated “entering the kingdom of heaven” to the situation that just took place. Before proceeding, we must observe that the call to “sell all” and the result being “treasure in heaven” (19:21) shows that the man’s question and Jesus’ answer were not in regard to whether or not the man was “saved,” so we must not let the term “entering the kingdom of heaven” deter us to think this. Jesus further elaborates upon His point by giving an illustration about the difficulty of “a camel to go through the eye of a needle” (19:24a). This expression is known as a “paroimia” which is a “way side saying, a trite expression, a common remark, or a proverb.” This expression was used to communicate “a thing very unusual and very difficult.” This has often been communicated as an opening in the wall surrounding Jerusalem that required for the camel to get down on his knees in order to pass through into the city. While this may be a commonly accepted explanation, some scholars believe that there is no evidence to conclude this. Regardless, the point in Jesus’ use of paroimia is clear: Those who trust in their riches in this life will find great difficulty in obtaining a rich entrance into the kingdom of heaven. This is due to their wealth becoming their security, hope, and the answer for every problem. Why pray and wait on the Lord when you can simply buy a solution to your problem? When one is called to follow Jesus, proceeding forward can only be done by faith in the Son of God. This is much like the argument in Galatians 3:1-3. We are not justified by faith alone and then proceed to grow in our Christian walk by another means than faith in Christ. Our growth is predicated upon faith alone in Christ alone, just as is the case of our justification. Divided interests when faced with the opportunity for a rich entrance in the coming Kingdom is an incongruent concept. With verse 25, we see that the disciples’ response to Jesus’ application is one of shock! In the first century, the Jews would have concluded that material wealth was a sign that God had greatly blessed that family. Jesus’ comment has shattered this stereotype, opting instead to promote trusting in Christ which gives way to obedience in following Him. The idea of being “saved” should not be thought of as “go to heaven when you die,” but rather “saved” from a worthless life, a life of little value in the coming Kingdom. We know this to be true because of the indicators found in 19:16 with “obtaining eternal life,” 19:21 with Jesus equating “treasure in heaven” with the man’s desired conclusion to “obtain eternal life,” 19:23 with Jesus’ use of the “kingdom of heaven” as the primary subject under consideration in this section, and with 19:24 demonstrating that the “kingdom of heaven” is the same thing as the “kingdom of God.” At no time do we have any allusions to the cross of Christ, the blood of Christ, or the sacrifice of Christ. The only sacrifice called for in this section is found in relation to the rich young man selling his possessions and following Jesus (19:21). Matthew 19:27-30. At this point, Peter asks a question concerning himself and the group obviously provoked by this incident that they had just witnessed and Jesus’ subsequent teaching in light of the results of the rich young man’s choice. If what Jesus just concluded was true, where did this leave the disciples? They had walked away from their businesses (Matt 4:18-22; Mark 2:14; Luke 5:27) and had obviously left their families (Matt 8:14). In Peter’s own words, the had left “everything” to follow Jesus (Matt 19:27). Peter understood that he and the other disciples had been obedient and had “paid the cost.” What would be the return on the decision that they had made? Jesus’ reply is not harsh, or rebuking, but He unfolds the beauty that awaits those who sacrifice to follow Christ because they should be expectant of something in return for their service to Him. “Rather than upbraid Peter for what may seem like a selfish request, Jesus assured him that the life investment he and the other disciples had made (16:24–28) would have dividends ‘a hundredfold’ (v. 29).” Jesus tells His disciples that in the “regeneration” they will be in positions of judgment over the twelve tribes of Israel (19:28). What is meant by the term “regeneration” is clear, seeing that Jesus gives us a time indicator in stating that it is a period “when the Son of Man will sit on His glorious throne.” We know this to be speaking of the Millennial Reign of Christ (Rev 19:11-20:6). This word “regeneration” is palingenesia in Greek meaning a “state of being renewed, with focus on a cosmic experience, renewal.” It has been translated in English as “renewal” (NIV, CSB), “new world” (ESV), and even the “Messianic Age” (HCSB). Thayer understands it as “that signal and glorious change of all things (in heaven and earth) for the better, that restoration of the primal and perfect condition of things which existed before the fall of our first parents.” Scofield writes of it as “the re-creation of the social order, and renewal of the earth (Isa. 11:6–9; Rom. 8:19–23) when the kingdom shall come.” Clearly, Jesus’ meaning is consistent with the subject at hand, being the coming Kingdom of Heaven, the Millennial Reign of Christ. Jesus then adds that anyone who has left that which they have loved behind for the sake of Christ’s name will receive “many times as much” (NASB), which is probably better understood as “a hundred times” (NASB margin) or “a hundredfold” (NKJV, ESV). Two things must be noted in this statement. First, a sacrifice of this magnitude must be made with the proper motivation fueling it. That motivation is clearly stated as “for My name’s sake” (19:29b). The person forsaking that which is comfortable and secure hoping to receive accolades or fame from such a sacrifice will receive nothing. However, the one who deems Christ as “worthy,” meaning that He is worth following wherever He may lead them to go, is one who will receive a great reward for the sacrifice that they have made. This type of obedience demonstrates the proper motivation and the humble heart of the one serving Christ. Second, the use of the term “a hundredfold” should draw our minds back to the Parable of the Soils, especially the fourth soil in Matthew 13:23. We are told that those who “understand” the word of the kingdom will be the ones who “bear fruit” in various increments, and in some cases, it will be a hundredfold. Jesus speaks of a second result regarding those who leave their loved ones for Christ’s sake. They “will inherit eternal life” (19:29c). This is precisely what Jesus was calling the rich young ruler to do: sell his possessions and follow Him so that he would have “treasure in heaven” (19:21b). This phrase “inherit eternal life” perfectly corresponds with the rich man’s initial inquiry in Matthew 19:16 about how to “obtain eternal life,” especially when compared with the parallel accounts in Mark 10:17 and Luke 18:18. There is a cost in this life for following Jesus, but if one is willing to pay it for the sake of Jesus’ name, it will yield great dividends beyond our comprehension in the life to come! Jesus finishes His reply by stating that “many who are first will be last; and the last, first” (19:30). Parting with our loved ones or ridding ourselves of our valuables for the sake of Jesus’ name would be things that would place us in the category of “last” in this present age. Such people are considered lunatics. But we must remember that the world knows nothing about the joy that stems from those who not only have peace with God from their justification, but the peace of God resting over them because they are in the center of God’s will for their lives. To the world, belief in God, much less parting with one’s “stuff” to follow Jesus Christ, is written off as “fanatical” without being given a second thought, and because it is spiritually motivated and lacks the “glamour” that dictates so much of the decisions that carnal people make, it must be discredited and demeaned, and the message of those who have “left all” is denied. Those who are last in this life will be first in the life to come. Those who are first in this life, meaning that if they are believers in Jesus Christ but are living for themselves (Eph 5:11-12), persisting in sin and disobedience (Eph 4:17-20; 1 Tim 1:29-20), are only carnal in their Christianity (1 Cor 3:3-4; Titus 3:9-10), and are unwilling to part with the things that they hold dear if called upon by the Lord to do so (Matt 19:21), they will be last in the coming Kingdom of Christ. What is Jesus calling you to do so that you will have treasure in heaven? See MacDonald, Believer’s Bible Commentary, p. 1276–1277, Alan P. Stanley, Did Jesus Teach Salvation by Works? (Eugene, Oregon: Pickwick Publications, 2006), p. 188-211, John F. MacArthur, The Gospel According to Jesus (Grand Rapids: Academie Books, 1988), p. 78-88. Thayer, Greek-English Lexicon, p. 618. Louw and Nida, Greek-English Lexicon, p. 705. Joseph C. Dillow, Final Destiny: The Future Reign of the Servant Kings (Monument, Colorado: Paniym Publishing, 2012), p. 253. E.W. Bullinger, Figures of Speech Used in the Bible (Grand Rapids: Baker Book House, 1968), p. 755. See James M. Freeman and Harold J. Chadwick, Manners & Customs of the Bible (North Brunswick, NJ: Bridge-Logos Publishers, 1998), p. 447. See Craig Blomberg, Matthew, vol. 22, The New American Commentary (Nashville: Broadman & Holman Publishers, 1992), p. 299–300; David Turner and Darrell L. Bock, Cornerstone Biblical Commentary, Vol 11: Matthew and Mark (Carol Stream, IL: Tyndale House Publishers, 2005), 252. Earl D. Radmacher, Ronald Barclay Allen, and H. Wayne House, Nelson’s New Illustrated Bible Commentary (Nashville: Nelson Publishers, 1999), p. 1177. Thayer, Greek-English Lexicon, p. 474–475. C. I. Scofield, ed., The Scofield Reference Bible: The Holy Bible Containing the Old and New Testaments (New York; London; Toronto; Melbourne; Bombay: Oxford University Press, 1917), p. 1026.